Découvrez de nombreux sites et attractions de l'Égypte ancienne lors d'une visite combinée d'une semaine. Après une prise en charge à l'aéroport au Caire, visitez les célèbres pyramides de Giza et du Sphinx avec un égyptologue, prenez le train de nuit jusqu'à Assouan et détendez-vous lors d'une croisière guidée sur le Nil. Visitez d'importants temples à Louxor et en Cisjordanie et profitez de l'hébergement et des repas inclus dans le prix du voyage. Great trip,we had a good time , our tour company was reflections in Egypt. We think the best part was the nile cruise. Our guide Mohsin was the best he took us from Luxor to Aswan. He was very knowledgeable and thorough. The guide in Cairo was Ismail, he was not so great. Overall good trip. 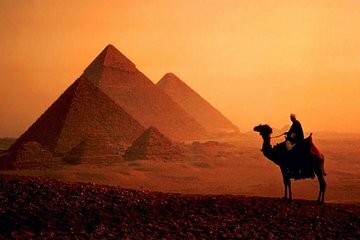 If it's your dream to see the Pyramids, explore the tombs and ancient temples of the pharaohs, look no further! Eight days and you really will get the opportunity to do it all. Egypt has had a rough couple of years lately for tourism, and what that meant for me at least was I really received first-class service and was incredibly well looked after from start to finish. I was escorted to and from each location, all the details of the trip were handled in advance, and everything ran like clockwork. My guides absolutely made this experience exceptional. They were knowledgeable, loyal, friendly- they each served as my guide/translator/bodyguard and friend- It's difficult to say how long these sites will remain in the incredible condition that they're in, and whether travel may be restricted in the future. So as i have said, if it's your dream to do Egypt, as it was for me... This is the time!